Product prices and availability are accurate as of 2019-04-20 09:22:09 UTC and are subject to change. Any price and availability information displayed on http://www.amazon.com/ at the time of purchase will apply to the purchase of this product. 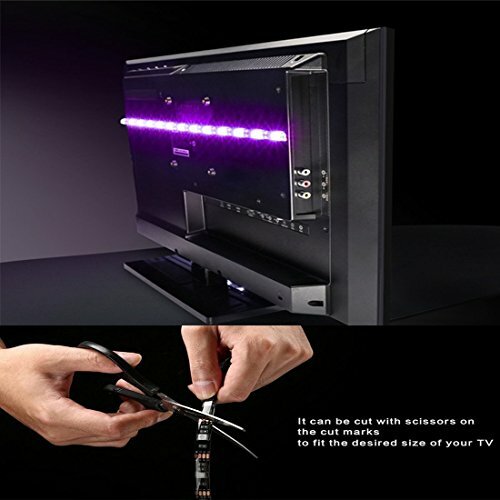 - Customized light kit for 32 to 46 inch HDTV. - 20 colour modes options, brightness adjustable. - Powered by TV USB port, no messy wire. - Control the light with remote, make things simple. - Don't worry about the adhesive tape, it's 3M VHB tape,very sticky. - It turn on/off with tv synchronously. 1.Cut(As needed): Cut On the Cut Marks (White Lines) on the strips to desired length. 2.Peel: Remove the adhesive backing on the strips. 3.Firmly Press the strips in desired place and Connect the USB to USB port. 4.You can press the speed/bright button for 3 seconds to turn on/off the controller. Relieve Your Eye Strain - Quality Bias Lighting can help reduce the eye strain cuased by long exposures to TV screens and monitors in dark rooms. It can also help make the grays and blacks on your screen seem richer. Easy Installation - 35.4'' Strip + 46.45'' USB cable + A Spare 3M Adhesive Tape , High brightness 30 quality LEDs, Cut the Led Strip with Scissors On the Cut Marks (White Lines), NOTE: Don't cut the light too short, it should be long enough to be placed in the middle of the back of your tv, Please refer to the 4th image! ; Remove the adhesive backing on the strips. Firmly Press the strips to the rear of your tv approx. in the center between top and bottom, then connect the USB TO USB port. Super Sticky Adhesive -The 3M 300MP adhesive(it has better viscosity than 3M 200MP) provides secure and strong installation without worrying about falling off. 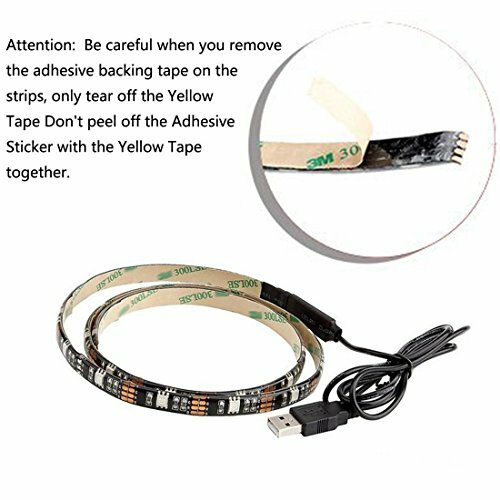 Attention: Be careful when you remove the adhesive backing tape on the strips, only tear off the Yellow Tape. Don't peel off the Adhesive Sticker with the Yellow Tape together. 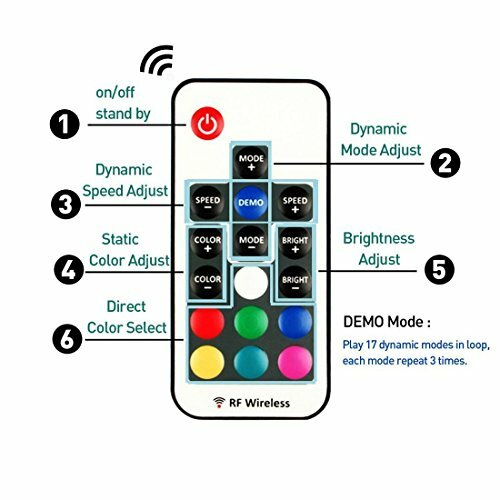 Control the Light with Remote - Come with 17 key mini RF remote, has 20 colors for you to choose. You can use the remote control change the color, the brightness as well as different lighting modes. Wireless range: 50ft. 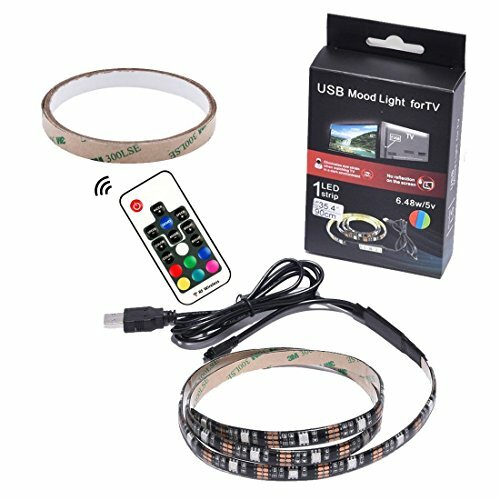 Fit your mood - Customized light kit for 32 to 46 inch HDTV. 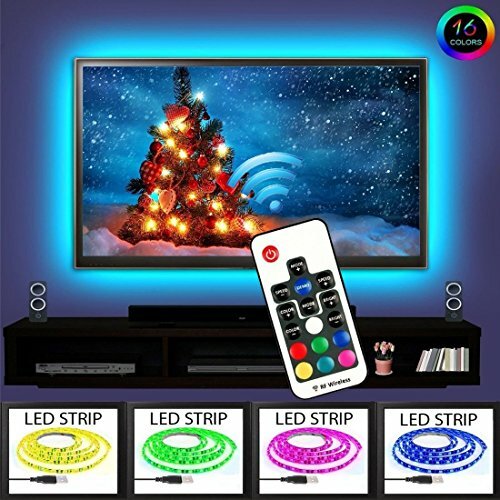 ( NOTE: This Led Light Strip is 35.4inch and Comes with a Spare 3M Adhesive Tape for your convenience). 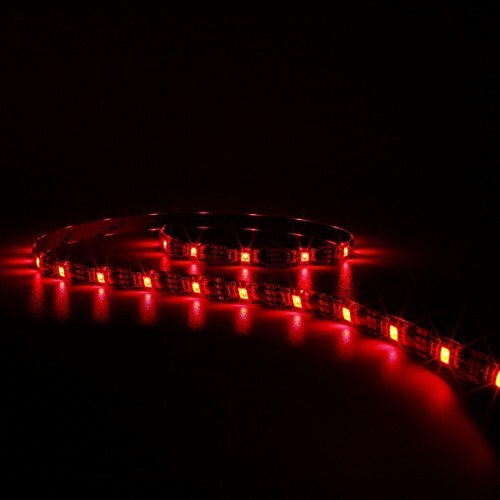 Use the LED Strip to light up or create festive lights on your monitor, TV, or furniture. Choose from solid colors, strobes, or cycling colors to fit your mood! You can easily swap between colors and lighting modes using the remote control.